Warming, comforting, nourishing soup is a winter favourite for my family. I try to incorporate at least two soup meals a week during the colder months, and we enjoy experimenting with ingredients and combinations to keep things interesting. The Smoked Snoek soup I made for the “Eat for the Earth” lunch was a hit, as was the Seafood Broth with Hake Fishcakes. The basis of a great soup is definitely a good stock. To be honest, although I know this statement is true, I only recently started making my own fish stock and have come to realise that fresh stock is well worth the effort! Fish stock is one of the easiest and quickest stocks to make and only takes 30 minutes to cook. Once the stock is made, a delicious fish soup is just a few quick steps away. The stock is already so tasty you don’t need to add much more to make a scrumptious soup. When you next buy fish, ask your fishmonger to keep aside some trimmings for stock. I always have extra trimmings and often freeze it for customers. Just be sure to ask them not to include the gills or entrails as they are bitter and will not improve the flavour of your stock. Cover with water (about 3 litres). Once the water is boiling turn temperature down and simmer. Skim off foam that rises to the surface (you only need to do this once or twice). Strain through a sieve into a bowl. For an extra clear stock strain through a muslin cloth. The stock can be kept in the fridge for 3 days or frozen. 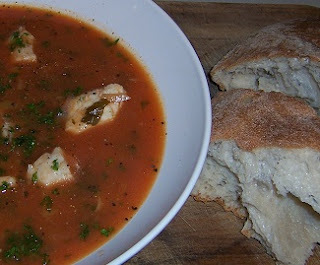 Now that you have super tasty stock, it’s easy to make a delicious seafood soup. Add leeks, garlic and chilli. Allow to cook on a moderate heat for 10 minutes (do not brown the leeks). Add the wine, fish stock, tomatoes, bay leaf and thyme. Simmer for a further 5 minutes or until the fish is cooked. Season with salt and pepper (add a little sugar if necessary). Finish off with chopped parsley and serve with crusty bread. This peasant-style soup always makes me feel like I’m in the Mediterranean and all I need is fresh fish, cheese, bread, and wine. Can life get any better?